Anyway it is, I believe, the first appearance of the Renault 16TS when the Gift Set came out in 1968. 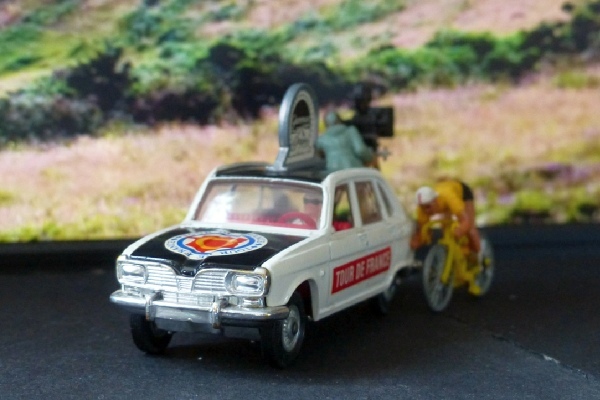 The Renault has had a conversion with its hatchback completely removed and an extended floor added on which there is a cameraman and a beautifully detailed camera. (That is actually quite remarkable - with a nice jewel even as its lens). In addition the Set would has a cyclist on a racing bike. The bonnet opens and there’s a spare wheel in there. I always thought that this would be a Golden Jacks model in normal saloon form but that didn’t happen. Understandably there’s no folding seat mechanism on this one. This is complete apart from a bike stand, all original and in superb condition. The only fault is a slight split in the cellophane. Very hard to find in this condition.